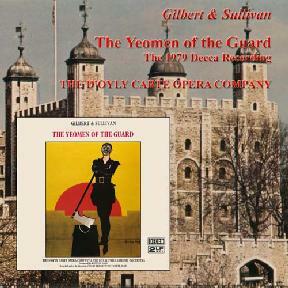 The 1979 Yeomen brought the original D'Oyly Carte Opera Company's long and successful history of recordings to a close. The Company would exist for three more years, but it would not enter the recording studio again. This recording, however, was certainly a strong farewell to the gramophone. Of the seven operas recorded in both the '60s and the '70s, this is the only one that matched the artistic excellence of its predecessor. There are at least two notable features about this Yeomen. One is the inclusion of the deleted aria for Sergeant Meryll, "A laughing boy but yesterday." 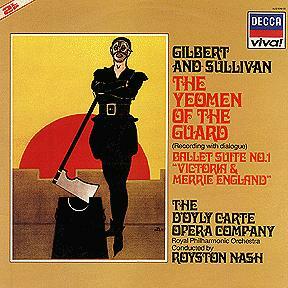 This was not only the first time that D'Oyly Carte recorded this number, it was also the first time that the Company recorded material of any kind that Gilbert and Sullivan themselves had cut. The other notable feature is the inclusion of the dialogue between "Here's a man of jollity" and "I have a song to sing, O"; this was omitted from previous Yeomen recordings. The one reservation, and unfortunately it's a big one, is John Reed's weeping "Oh, Elsie, Elsie, Elsie…" during the Act II finale. While this may have worked on stage, on record it upstages the rest of the music and seriously grates on the ear. One regrets, too, that the dialogue was not included (aside from the one scene mentioned). If you are interested in John Reed's Point then do not under any circumstances listen to the 1970's D'Oyly Carte recording of Yeomen. I listened to this for the first time about five months ago, having had it sat on my shelf since I inherited it seven years ago! It's a wonderful recording until it gets to the Finale in Act 2 where, 37 different kinds of ham are layered across the production by John Reed. I'm not saying that this wasn't his traditional business at this point, but on the recording he is given far more prominence by the studio than he would ever receive on stage — and this completely unbalances these most moving moments — I was laughing at it at first, then after a while I was actually wanting him to die! I personally don't like John Reed's recorded performances — please note the very careful wording of that last statement — but in this case I think he was severely let down by the recording studio, the producer, and whoever had artistic control of the recording. As an added bonus, this recording was issued with a suite of music from Sullivan's ballet, Victoria and Merrie England. The ballet suite has been re-issued on CD with the 1976 Utopia. The opera has been re-issued on Sounds on CD.